Almost everyone understands the importance of regular brushing and flossing to their oral health. You've heard it many times before, at office visits and checkups: Proper oral hygiene is your first line of defense against tooth decay and gum disease. Yet, while most of us brush regularly, many people don't floss as often as they should… or at all! Consistent brushing with fluoride toothpaste has been proven effective at removing dental plaque from the tooth's surfaces and making them more resistant to decay. But regular toothbrushes simply can't get into the small gaps between teeth, or the tiny crevices where teeth meet gums. Unfortunately for our oral health, that's exactly where tooth decay and gum disease starts — and that's where the tools called “interdental cleaners” can help. 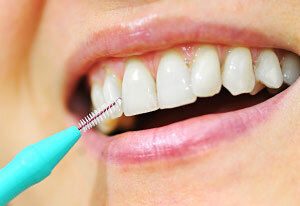 There are several different types of interdental cleaners available, including special brushes and irrigation devices (commonly called “water picks”). None of them, by themselves, are a substitute for brushing and flossing. However, as part of a regular program of oral hygiene, they can be effective at fighting plaque and reducing the incidence of tooth decay and gum disease. This specially designed toothbrush (sometimes called an interproximal brush or proxabrush) can be successfully utilized to clean the small gaps between teeth, as well as the gums and the areas around braces, wires, or other dental appliances. Because it has a handle not unlike a standard toothbrush, many people with limited dexterity find it easy to use. Plus, numerous clinical studies have demonstrated its effectiveness at reducing plaque and controlling gingivitis (gum inflammation). 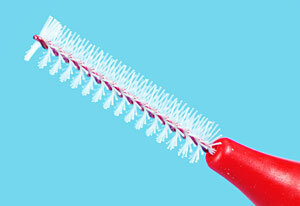 The cleaning surface of an interdental brush is similar in shape to a small, conical pipe cleaner. Its short bristles radiate from a thin central wire, which is small enough to pass through a very tight space. The brushes are available with both coated and uncoated wire, and come in different widths to accommodate an individual's particular dental anatomy. When needed, they can also be used to apply antibacterial or desensitizing agents to certain areas of the teeth or gums. Available to consumers for over 50 years, these devices (sometimes known as water jets or water picks) can also play a role in interdental hygiene. While their popularity has gone up and down over the decades, many studies have shown that they provide a safe and effective method of diluting the acids produced by plaque. Irrigation devices typically use pulsed or steady jets of pressurized water to remove food particles from the hard-to-clean interdental spaces, as well as in some subgingival (below the gum line) pockets. Proper brushing and flossing is still generally considered the gold standard of at-home oral hygiene. But if you have trouble flossing regularly — or if you're at increased risk for developing dental or periodontal disease — then using these interdental cleaners might be right for you.